STI was up 4.7% in 1Q19. All of its gains were chalked up in January. Performance turned flat in the following two months. 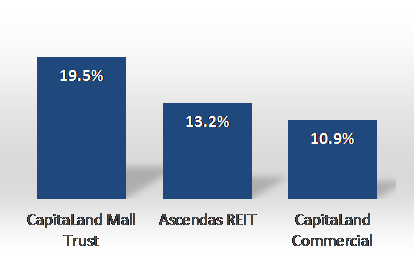 REITs (Figure 1) and cyclicals (Figure 2) led the charge while banks were a drag (Figure 3). 2019 kicked off with two policy risks; a hawkish Fed and escalating trade tensions between the U.S. and China. The STI rallied when both these risks started to fade. 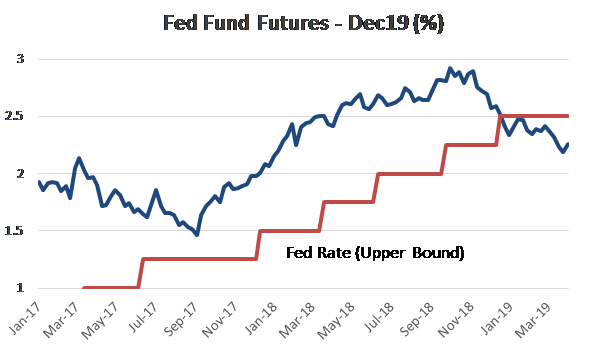 Risks of higher interest rates abated when the Fed emphasized the need for patience on monetary policy. Encouraging comments by President Trump that trade talks were progressing well added fuel to the rally. What held back equity markets was a deceleration in global growth. 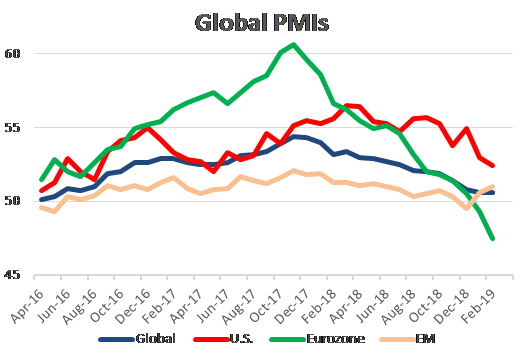 Global PMIs approached 3-year lows while fixed income markets priced in recessionary conditions through a yield curve inversion. We remain positive on the equity markets. Our premise is a renewed upturn in global growth. Firstly, financial conditions have eased. 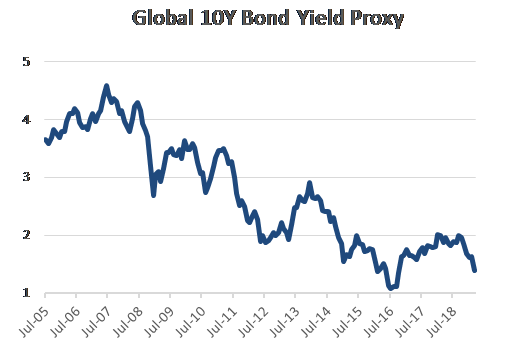 Following the Fed’s signal of a dovish stance, global interest rates have nose-dived back to 2-year lows (Figure 8). Secondly, the Chinese government is visibly providing fiscal support. It has rolled out tax cuts, relaxed financial conditions and accelerated investments. We believe there is a lag to these policy benefits. Thirdly, there are some early signs of revival in economic activity. 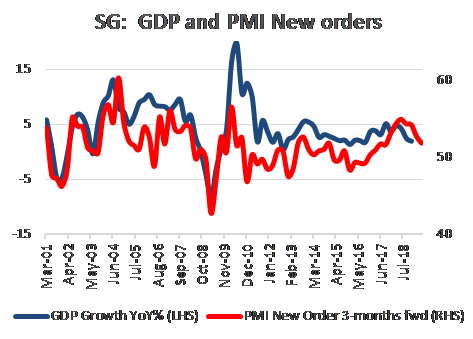 Global PMI has started to stabilise (Figure 4). The next impetus for the rally, we believe, will be some form of U.S.-China trade deal, expected in early-May. No one expects this Thucydides’ Trap to be avoided anytime soon but a trade resolution should remove risks of tariffs escalating further. We are raising our STI target to 3600 from 3400. This pegs the market at 14x, close to its 10-year average valuation. Government policies have turned more supportive for equity markets. Interest rates have eased and we expect growth to surprise positively. The Phillip Absolute 10 model portfolio was up 7.1% in 1Q19. Our yield and re-rating recommendations played out well. Growth and finance stocks disappointed. 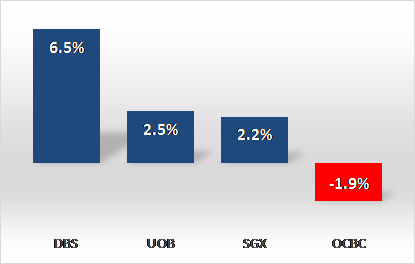 Nevertheless, we maintain both UOB and SGX in our portfolio. Both should benefit from a recovery in economic conditions and capital markets. 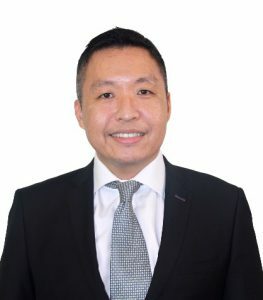 Ascendas REIT and CapitaLand Commercial Trust have reached our target prices, hence we will be replacing them with: (i) NetLink Trust, which will anchor the portfolio from its stable yield from 1.3mn recurring customers; (ii) Ascott REIT, given its attractive dividends and S$880m debt headroom for acquisitions. We removed Geo Energy following consistent production and cost disappointments, replacing it with Singtel in our portfolio. We believe the delays in a full-scale launch by the 4th mobile operator, TPG, will affect Singtel’s ability to gain traction in Singapore. Profit pools and scale are being built up by the MVNOs. They are wholesale customers for the incumbents including Singtel. Furthermore, we expect Singtel’s largest associate in Indonesia to recover in earnings as mobile prices have started to creep up again. 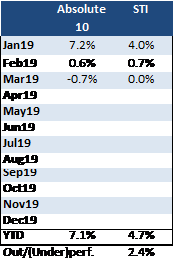 The Phillip Absolute 10 model portfolio was up 7.1% in 1Q19. 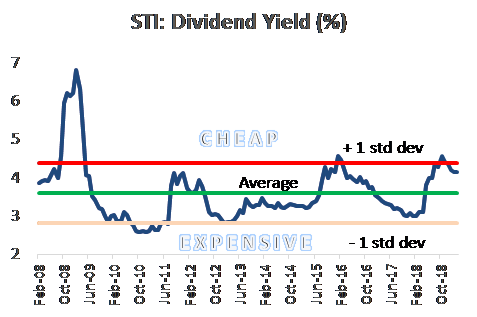 We outperformed the STI by 2.4% points (Figure 11). Our yield and re-rating plays performed well. With interest rate expectations nosediving (Figure 9), REITs rallied as investors searched for yield. Sentiment over commercial property was also fuelled by several transactions that were above market valuations. 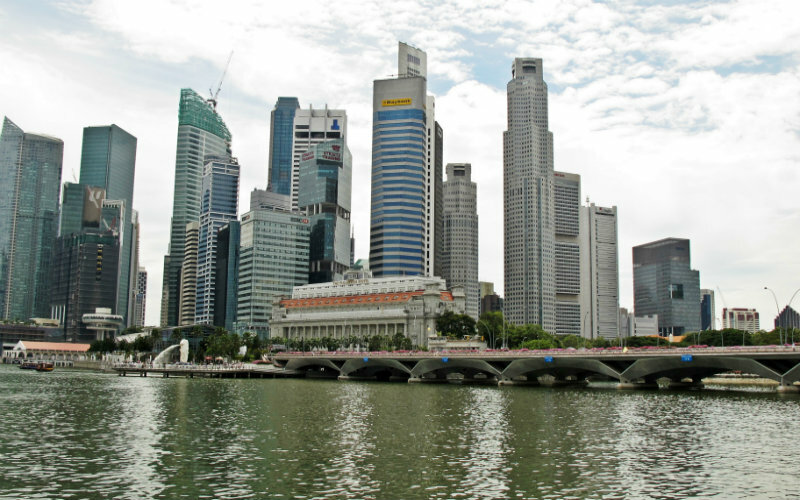 CapitaLand share price enjoyed an uplift with a S$11bn transaction to acquire Ascendas-Singbridge portfolio of assets. Ascott REIT, attractive dividends and S$880m debt headroom for acquisitions. Singtel. We believe the delays in a full-scale launch by the 4th mobile operator, TPG, will affect their ability to gain traction in Singapore. Profit pools and scale are being built up by the MVNOs. They are wholesale customer for the incumbents including Singtel. Furthermore, we expect Singtel’s largest associate in Indonesia to recover in earnings as mobile prices have started to creep up again. 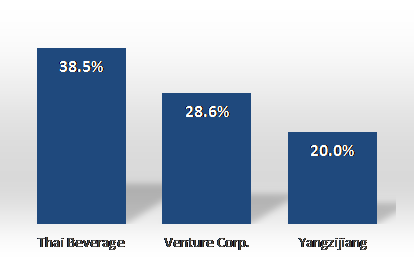 Despite the disappointing performance of China Sunsine, we will keep the company in our portfolio. 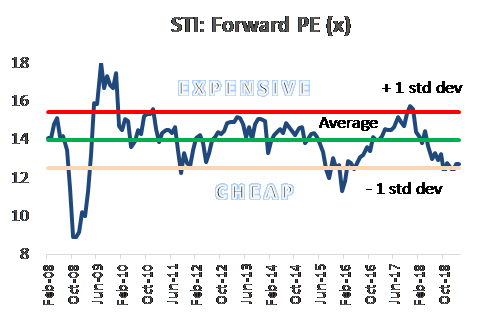 Valuations are cheap at 5x PE and we expect earnings to be supported by a rise in production and stable margins. Meanwhile, Sheng Siong will provide the earnings growth for the portfolio via its record store expansion. Consumer spending should also improve in view of the rise in wages and recovery in total employment in Singapore.